Provider reimbursement is evolving from fee-for-service to pay-for-performance. For independent pharmacies, this raises questions about what “performance” actually means, how it is measured, and what can be done to improve it. Increasingly, major health plans and top PBMs are enrolling participants in preferred pharmacy networks. In 2014, preferred pharmacy networks are anticipated to dominate Medicare Part D. It is estimated that there will be 56 Part D plans with a preferred pharmacy network, up from only 16 in 2013, and 72% of nearly 1,200 regional prescription drug plans will have a preferred pharmacy network.1 Also, 88% of employers have indicated a willingness to implement a preferred pharmacy network. The motivation of health plans and PBMs in forming preferred pharmacy networks is clear: to control costs and increase profitability. To participate in a preferred network, pharmacies must typically be willing to accept reduced reimbursement, thereby helping health plans, PBMs and employers control costs. Increasing revenue. Medicare Advantage Plans and Medicare drug plans are being rated annually on their performance, on a scale of 1 to 5 stars (“star ratings”). MA-PD Plans achieving star ratings of 4 (“above average”) or 5 (“excellent”) receive quality bonus payments, which can potentially represent millions of dollars in revenue. For more about changes in PBM network design, see How Narrow Networks Are Changing Pharmacy. An area where pharmacies play a critical role, which is currently only a monitored “display” measure but is expected to count toward a plan’s star rating in 2015, is comprehensive medication review (CMR) completion rates. Other display measures still being evaluated include drug interactions, excessive doses of oral diabetes medications, and HIV anti-retroviral medication adherence (via safety reports). New tools have been developed to help pharmacies understand how they are performing on the types of quality measures that now matter to health plans and PBMs. One tool is EQuIPP™ (Electronic Quality Improvement Platform for Plans and Pharmacies) developed by Pharmacy Quality Solutions (PQS). PQS is a joint venture between CECity and the Pharmacy Quality Alliance (PQA), a non-profit with over 100 member organizations that collaboratively develops strategies for measuring and reporting performance information related to medication, including those currently being used for CMS Medicare Plan Star Ratings. 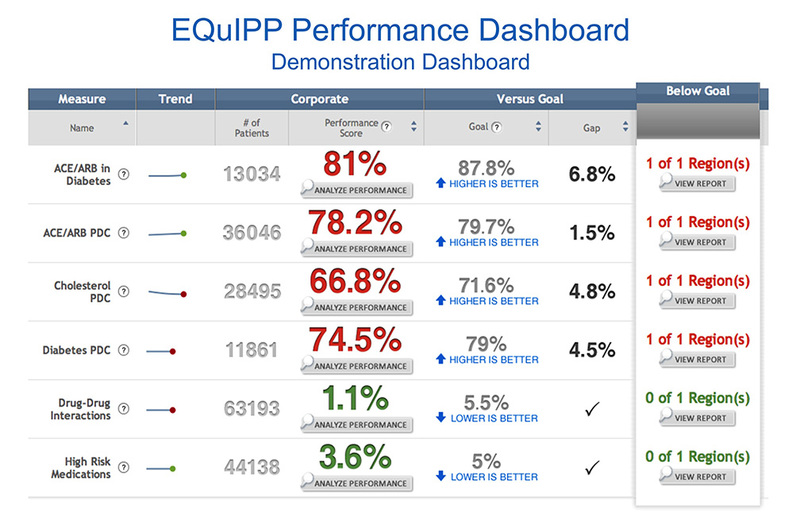 EQuIPP is a web-based performance-management tool that makes unbiased, benchmarked performance data available to both health plans and community pharmacy organizations via user-friendly dashboards to bring a level of standardization to the measurement of the quality of medication use. This sample EQuIPP dashboard report7 shows how a pharmacy would see its performance on several key measures compared to a predefined goal and whether the pharmacy exceeded its goal or fell short. If below its goal, the pharmacy would also understand how great the gap was. Also, a pharmacy can see how its performance compared with others in a specified group, such as those in the same state. This is similar to the performance information that PBMs have at their disposal in making decisions about which providers to include in or exclude from their preferred networks. By knowing performance on each key measure and performance in comparison to others, pharmacy owners can identify where improvement is needed and can establish priorities. Under IEHP’s Pharmacy P4P Program, launched in October 2013, pharmacies will be eligible for a bonus payment every six months based on the quality of medication-related care they provide to IEHR members. Participating pharmacies will be evaluated on how they perform on Medicare Part D Star Rating measures (e.g., medication adherence and safety) plus asthma and generic dispensing rate compared to predetermined standards. Each pharmacy in the IEHP network is able to track its performance via personalized dashboards within PQS’ EQuIPP platform. IEHP will also publically recognize pharmacies that achieve high quality scores. In this new era of performance, understanding why quality is so important to health plans and PBMs and which measures matter most is the starting point. Now is the time to start assessing whether your pharmacy is meeting standard quality benchmarks. Know your pharmacy’s performance numbers for key adherence and other measures. Understand where you need to improve and how you rank compared to your peers. Being able to meet and exceed PBMs’ expectations is essential in ensuring ongoing network participation and access to a steady stream of patients. 1 For 2014, More Than 70% of Medicare Part D Plans Have a Preferred Pharmacy Network, Adam J. Fein, Drug Channels, October 15, 2013. 2 Reid, R., Deb, P., Howell, B. et al. Association Between Medicare Advantage Plan Star Ratings and Enrollment. JAMA. January 16, 2013. Vol. 309(3):267-274. 3 CMS’ Star Ratings Program, Vikki Oates, CMS, Slide 8. 4 Medicare Part C & D Star Ratings: Update for 2014, CMS, Part C & D User Group Call, August 7, 2013, Slides 32–41. 5 CMS Star Ratings; Compounding Bill Passes Senate, Heads to Obama, American Pharmacists Association, December 1, 2013. 6 Nau, D. Pharmacy Quality Alliance (PQA). Proportion of Days Covered (PDC) as the Preferred Method for Managing Adherence. 7 EQuIPP Performance Dashboard, presented by David Nau in “Written in the Stars: A Community Pharmacist’s Practice Guide to the Star Rating System,” 2014 NCPA Multiple Locations Conference, Naples, Florida, February 14, 2014. 8 Inland Empire Health Plan (IEHP): Pharmacy P4P Program web page. The information provided here is for reference use only and does not constitute the rendering of legal or other professional advice by McKesson. Readers should consult appropriate professionals for advice and assistance prior to making important decisions regarding their business. McKesson is not advocating any particular program or approach herein. McKesson is not responsible for, nor will it bear any liability for the content provided herein.